To avoid costly repairs or unexpected downtime, it’s important to maintain your electrical components. Businesses in the Preston are can take advantage of Greenway’s preventative electrical planned maintenance services. Contact Greenway to discuss your Planned Maintenance needs. 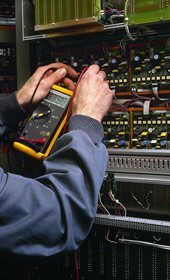 An electrical contract that includes planned electrical maintenance allows us to regularly visit your commercial or industrial premises to check that equipment is working as it should. We can carry out fault-finding, as well as identifying any non-immediate issues that may become issues before our next visit. We are equipped with our own access platform and are able to carry out maintenance to car park and amenity lighting. We’ll be happy to set up a maintenance contract with visits at intervals to suit your requirements, keeping your electrical systems running as they should. For more information, contact the office by phone or email.